Posted by Ada Wang on 12/4/2018 3:35:15 PM. There are lots of Kindle tips, tricks, freebies and service available to amplify our use of Kindle and help construct a perfect eLife system apart from Kindle’s limited built-in apps. A host of tips & tricks as well as free software and service are covered in this guide. In all probability, you have used many of them as what I’ve written is a Kindle tip summary for the public not exclusively for Kindle geeks. Any comments will be terribly needed if they are instrumental for Kindle customers. Most Kindle users are familiar with this well-known freeware, Calibre, which is generally used to convert eBooks from one format to another. 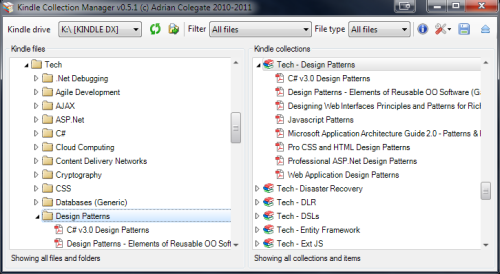 In fact, Calibre offers a variety of functions besides converting eBooks. Searching for eBooks on Calibre saves time & money for you. Around 50 eBook stores, including DRM-free stores are integrated into this platform for searching eBooks, where detailed description (book name, DRM status, price, store, etc.) of an eBook will be listed. You are able to get a non-DRM book at the most reasonable price. Calibre delivers options for your subscription to news from 1317 sources in over 40 languages. Just have a try. 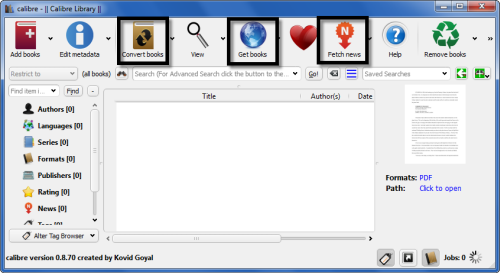 lendle is a useful application to help people borrow Kindle eBooks from eBook owners and lend Kindle eBooks to others. Thus if you own at least one Kindle eBook, you are qualified to borrow Kindle books from other people. You don’t have to own any Kindle readers as you can read the lent books on your Kindle for PC or other Kindle apps. However, there are some restrictions for lendle as well. The tally of Kindle books you are allowed to borrow hinges on how many Kindle books you possess. The more Kindle books you own, the more books you can borrow. The borrowed books will belong to you for 2 weeks’ duration. Instapaper is a simple tool to save web pages for reading later, which can be installed on computers, apple series as well as android devices. Just register for free and you can save the URL of the interesting contents for reading later. An email address will be generated at random so that you can send links to this address. Accordingly, anything you send to this address will be added to your Instapaper account. As part of our daily life, Google calendar would be useful for you though the interface is kind of plain. Just launch your browser and input www.google.com/calendar/m. Google Calendar empowers you to add your appointments within one month. Google Gmail, Hotmail alongside Facebook all contribute to Kindle. The following URLs for mobile will be of help. Well, this might be a miner trick for some people as there is Google Translation existing already. However, sometimes you will get perpetuated by its thumbnail characters and the inappropriate translations. KindleFish delivers big enough alphabets to satisfy our eyes and it does a perfect job on phrase translation. Nevertheless, KindleFish works perfectly for Kindle 3G while there are trivial limitations concerning characters for 1G & 2G & DX titles. Hit “http://kindlefish.t15.org/” and take a look at it. 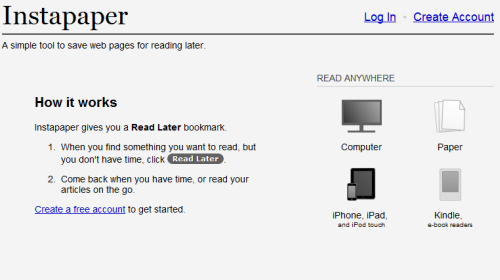 Together with Calibre, Google Reader, Bloglines is another good pick to subscribe RSS. Bloglines provides a friendly interface and actually attracts a cloud of Kindle customers to its territory. Just register with a new Bloglines account, pick up interesting feeds given on the site or search for blogs to your taste and add them to your created folder. Hit “subscribe” to complete your subscription. Go to the www.bloglines.com on your Kindle and sign in to reach your feeds. Bloglines brings a massive collection of feeds to you, though it is not as convenient as Kindlefeeder to some extent. 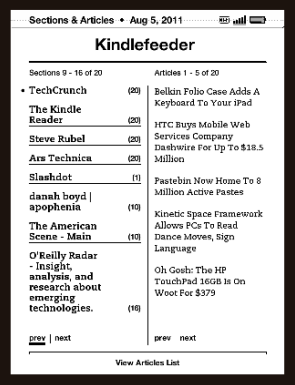 KindleFeeder is an easy-to-use feed aggregator, which is unquestionably designed for Kindle regarding its name. You can set a specified time for delivery and you will receive your RSS file on your Kindle device at that time. However, you are allowed to subscribe up to 12 feeds for free and only one file is sent to you at a time, which consequently accounts for its rapid delivery. Audible is a company based on Amazon. Its product, Audible Manager, has ascended to an indispensible tool to transfer your audio files to your Amazon Kindle. Make sure Audible Manager software is installed on your PC and is used for downloading audible books to computer. Follow this guide to start with Audible Manager. Or refer to the Audible Manager user’s guide. People who use twitter a lot latch onto KinTweet remarkably as it indeed does a better job than Kindle’s homepage. Follow the steps below to get to KinTweet through the built-in browser on your Kindle device. Navigate to KinTweet.com and press S to sign in once the page has been loaded totally. Kindle Collection Manager enables you to organize your Kindle titles including general eBooks and audio books collections on your computer. With various techniques supported, you are able to sort out your resources by simple drag-and-drop or copy-and-paste. You can create collections from folders as well as individual contents in multi-language including Russian, Chinese, Japanese, etc. One thing I have to point out is that you cannot launch Kindle Collection Manager on your computer unless your Kindle device has been connected to your computer via the USB cable. Even Kindle for PC is ineligible to drive this. Neither does Kindle Collection Manager act on Kindle Touch and Kindle Fire. 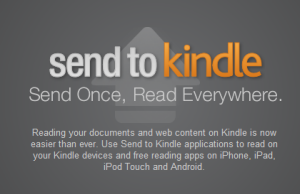 Send to Kindle is a software based on PC for sending personal documents to one’s registered Kindle, official Kindle reading applications alongside Amazon Cloud. However, official Kindle reading apps supported by Send to Kindle are limited to Kindle for Android App (at least version 3.5) and Kindle App for iOS series (iPad/iPhone/iPod). Once you have Send to Kindle installed on your computer, you can send your documents via Windows Explorer or any Windows application that offers printing function to your Kindle device. Supported file types are DOC/DOCX/TXT/RTF/JPEG/JPG/GIF/PNG /BMP/PDF. For sending documents via Windows Explorer, all non-PDF documents will be delivered in Kindle format while PDFs will remain the original format. For sending documents via any Windows application which supports printing, all documents are delivered in PDF format. For converting PDF to Kindle format, refer to PDF conversion on Kindle. 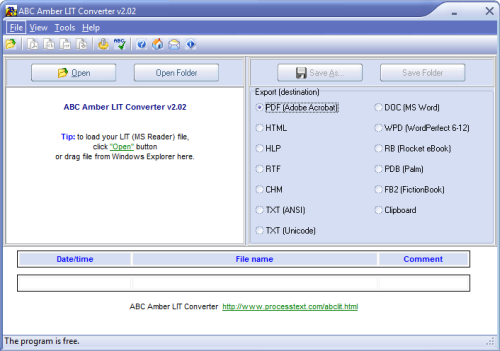 ABC Amber LIT Converter is an easy to use freeware aiming to convert LIT (Microsoft format) files to another popular format (PDF/HTML/HLP/RTF/CHM/TXT/DOC/WPD/RB/PDB/FB2) easily and quickly. ABC Amber LIT Converter supported DRM-protected LIT conversion, which brings along considerable convenience to customers. Multi files can be converted at one go. However, it seems not to work well as I used it once and it failed. Then I tried Calibre and it worked effectively. Therefore Calibre is no double the first candidate for non-DRM eBooks. There is a parallel tool named ABC Ambe CHM Converter for converting CHM to PRC. ABC Amber LIT Converter download. You must find it’s quite inconvenient to read Manga books on Kindle as those Manga books are based on pictures rather than general docs. Here is a freeware, Mangle, which will help you convert Manga with Python’s assistance. We have specially complied a list which contains 60 sites to download free Kindle books. Please click the link to get it. If you want to know where to download free Kindle screensavers, please refer to 7 places to get Kindle screensaver images. As Google discontinued Google Reader service, Feedly is becoming more and more popular. There is a free service called FabReadly, which can push all the RSS feeds in your feedly to your Kindle device. We collect a heap of regular tips and tricks for Kindle according to Business Insider and some other websites. Hold down ALT, Shift together with M to enter Minesweeper. Tap G to go to Gomoku from Minesweeper. Tap the “Menu” button and the number of your kindle’s free space will show up at the top left corner of your screen. For web browsing, navigating to mobile pages instead of traditional ones makes your browsing even faster. Turn off your Kindle by sliding and holding the power button for around 7 seconds. Or directly keep holding your Kindle for 15 seconds’ duration to restart the gadget. For basic calculations like 100+100, just type the characters in the search bar and press Enter to get the output. You can also input a random URL, right click the 5-way controller and select “go to” to see what happens. Holding down Shift, ALT, and G all at the same time helps you capture Kindle’s screen. The captured photo is typically saved in the folder named "Documents”. You can copy the photos to your disc with your Kindle connected to your computer via the USB cable. Press down on the 5-way controller and locate your cursor on a word. You will see the definition at the bottom of your screen. Press Enter for detailed explanation and press Back button to return to the content. In addition to the "experimental" MP3 player, following shortcuts will make your playing music convenient and flexible. Alt + R: reload current web page. Make sure to activate this function by tapping the "Aa" button in the bottom row of your keyboard. Navigate down to "screen rotation" to select a horizontal orientation that suits you. First, press "Menu"->"Settings" to get your device's email address (something like ***@kindle.com). Second, add this email address to your contacts list on your computer. Third, send the content you would like to read on your Kindle as attachments to your Kindle email address. The maximum of your attachments is 25. If any error occurs, it's probably due to such a fact that the emails your Kindle received come from unapproved email addresses. Start your computer to go to Amazon's "Manage My Kindle" page, select “Personal Document Settings” item and then you can add or delete your “Approved Personal Document E-mail List”. A trick to convert PDFs to Kindle format is enabled on Kindle email scheme. Set the subject of your email as "convert" with an attachment of PDFs and send to your Kindle address (***@kindle.com), you will receive your documents in MOBI format. In addition to browsing on Kindle, we can send web links to kindle via email. Create a document and add your interesting links to it. Convert the document to a PDF document and send it to your Kindle email address. Open the PDF, click any link for browsing. An alternative is to connect your Kindle with your computer using the USB cable and copy the PDF to the “Documents" folder of your Kindle. For searching on Kindle 1, use special prefixes to redirect your search for particular intentions. Pressing Enter on home screen will bring up a search window. If you use Kindle 2, navigate to right on the 5-way controller to select from those choices. Some people find their reasons to listen to Kindle books thus TTS (Text-to-Speech) constitutes a part of Kindle’s function. To turn on this function, just open an Amazon Kindle book, press the Menu button and shift TEXT-TO-SPEECH setting to ON. Male voice and Female voice are provided and select a mode as you like. You can set the rate of the speech to further your listening experience. With Text-to-Speech playing, Kindle turns your book pages automatically to ensure your following in the content. At times we need to check emails on Kindle. Unfortunately, there is no built-in Kindle email app for sending and receiving emails as far as I know. The single solution is to achieve this through Kindle browser with the mobile version, which is marginally plain and restricted. 2. Type the address (mobile version) of your email provider into the URL box to Submit. The address of mobile version comes easy. Just add an “m” to the head of the regular URL. 3. Sign in with your username and password to check your email on Kindle. First plug your Kindle device to computer via USB cable, when they are connected, the Kindle screen will change to show you the device enters USB drive mode. Open the "documents" folder you can see the file "My Clippings.txt". Then you can easily copy it and paste in your computer's hard drive, to edit it, manage it, organize it to your private quotations book, or print it out. We all know how to delete books on Kindle device. Just locate the cursor under the book and press the rocker to the left. Or press the middle button under a specified book and scroll down to select “delete”. But sometimes we need to delete Kindle eBooks for good. In this case, we have to go to “Amazon.com“ to complete the operation. 2. Select “Books” on the left “Your Kindle Library” zone. Locate the cursor on the “Actions…” button of the book you are to delete permanently and select “Delete from library”. 3. Click “Yes” on the following warning window if you are sure you want to delete that book. Here is a detailed guide about how to delete Kindle books from device and cloud. Sometimes we find it annoying to read PDF files on Kindle. This guide covers how to zoom PDF on Kindle Step by step. Imagine you have a recipe on Kindle, isn’t it nice to have a paper copy at hand? Absolutely! However, there is even no “Print” button on Kindle for PC as we know. On the contrary, EPUB and PDF files are allowed to print on Adobe Digital Editions with print button supported. 1) For non-DRM-ed MOBI books, you can directly use free Calibre to convert MOBI to EPUB so as to print out your Kindle books (pages). 2) For DRM protected AZW/TPZ/PRC books, well, you have to remove Kindle DRM and then repeat last step. Kindle exclusively supports purchased Kindle eBook sync. For books purchased from Amazon, you are allowed to sync the page you left off and continue to read on another device installed Kindle app. For free books from public domains, there is actually a web-based eReader, ibis reader, which is able to help sync eBooks but not so ideal to some extent. Have a go if you are in need of this function. Some people may meet this problem, they purchased a book from Amazon, but the book didn't show up in their Kindle device or app. Now you can manually transfer the book to your Kindle device or app. 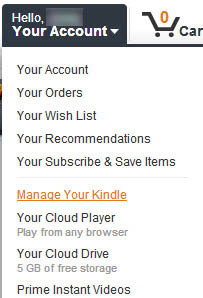 First go to Amazon and enter "Manage Your Kindle"
Then you can see all the items you have purchased, then click on the button right of the item's name, choose "Deliver to my..."
Then you can choose to which device or app you want to deliver this book, then go to the device or app and refresh your library. Not all Kindle books are allowed to be loaned and every book can be lent for 1 time at most. A kindle book can be loaned for 14 days. During this period the owner of the book cannot read that book. Check whether a Kindle book is lendable. Go to the book page of Amazon’s site, scroll down to the “Product Details” and check the “Lending” status. Lendable Kindle book will show “Lending: Enabled”. How to loan Kindle books. For lendable Kindle book, go to the "Actions" menu and look for "Loan this book" button. Click that button to loan your Kindle book to others. When viewing a page, you will find a large "A" and a small "A" at the bottom of the screen. Press either button to increase or decrease the font size on your Kindle. Go to the home page on your kindle, press the menu icon (three bars) in the upper right corner, then choose settings --- register/deregister. Click the gear icon in the upper right corner, and press "More...". Under "Applications" is "Date&Time", enter "Date&Time" option you can set the date and time manually. By default, the date and time is auto adjusting, in this situation you can only select your time zone. By switching auto adjust off, you can set the accurate time and date as you want. To wake up the quick setting on Kindle Fire HD, you can put your finger at the top of the screen then slide down, or press the gear icon in the upper right corner. Here are the settings that you can control from the Quick Settings menu: Unlocked/Locked, change volumn, change brightness, wireless connection, and sync the contents. Go to the home page on your kindle, press the menu icon (three bars) in the upper right corner, then choose "Settings", then look at the forth option "Device Options", press it you will be able to see "Device Time". 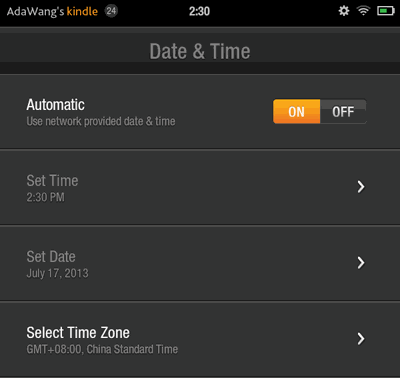 Press "Device Time" you can set the local time on your Kindle. Go to the home page on your Kindle Fire, click the gear icon in the upper right corner to active the drop-down menu, then choose "More...", then go to "My Account", you will see "Deregister" button there. This guide is writen for Kindle Fire users or lovers. A cool trick for you. We also gathered top 10 kindle fire cool tricks, see the full list? Thank you for taking the time to explain all this miss-mash, confusing stuff. 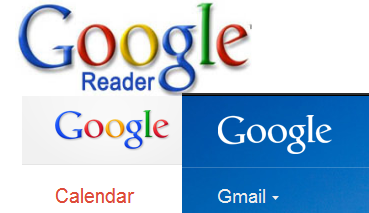 Google reader has been discontinued, please update! I'm desperate for a replacement service that will send any RSS to my kindle free - anyone found such a thing? Post updated. Please check the part "Push RSS to Kindle", introduces a free service to push Feedly RSS feeds to Kindle.